Tropical forests account for 7% of the world’s terrestrial surface area, yet they sustain half of the planet’s biodiversity, and provide vital products and services at a global scale. As the sphere of anthropogenic influence continues to expand, natural tropical forests are being displaced by human-modified landscapes, resulting in biodiversity loss and the potential breakdown of ecosystem services. Ecosystem service-orientated policies, such as REDD+, have emerged as a popular strategy to mitigate tropical forest loss and seek to assign economic value to natural capital, thus providing financial incentives for conservation. One key assumption of REDD+ is the delivery of ecological co-benefits, whereby forest protection/restoration to enhance carbon stocks will also conserve biodiversity. Global-scale analyses have highlighted the potential for tropical regions to deliver win–win conservation outcomes, yet coarse-scale methodologies that have been adopted mask local variation. Consequently, further investigation is required to determine spatial concordance between ecosystem services and biodiversity at the scale of a typical conservation management unit. Medium to large terrestrial mammals represent a model study system for such an investigation since they have substantial ecological roles in tropical forest ecosystems, are frequently prioritised by conservation assessments, and can serve as flagship species to reflect the needs of other taxa. Furthermore, their numerical and distributional spatial signatures over a landscape may reflect a cause or effect of compromised ecosystem functioning. Nick’s PhD research will address these concerns by assessing the spatial congruence between mammalian diversity and forest carbon stocks at a fine landscape scale. In so doing, he aims to understand the ecological response of tropical forest mammals to a gradient of landscape disturbance, but also the extent to which this variation in mammal diversity is associated with the carbon provisions prioritised by REDD+ policies. The study is based at the Stability of Altered Forest Ecosystems project (www.safeproject.net) in Sabah, Malaysian Borneo, in collaboration with the Southeast Asian Rainforest Research Programme, The Forest Trust Indonesia and colleagues at Universiti Malaysia Sabah and Imperial College London. Nick is instigating a camera trapping and acoustic monitoring campaign at SAFE and the wider landscape to test for covariation between biodiversity and carbon stocks. This dataset will also be used in additional analyses concerning connectivity and spatial planning for the landscape. His work is part of the NERC Human-Modified Tropical Forest Programme (http://lombok.hmtf.info/). 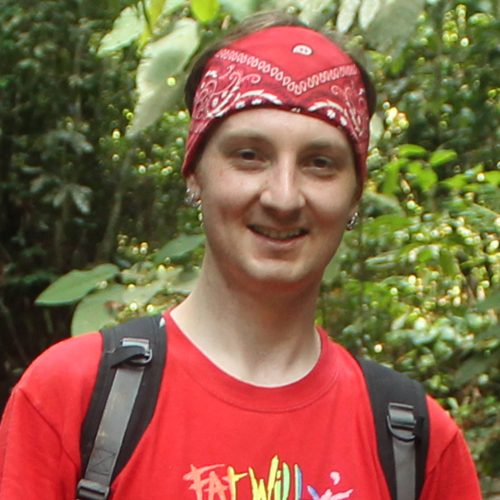 Nick Deere is a member of the Durrell Institute of Conservation and Ecology. Runting, R. et al. (2019). Larger gains from improved management over sparing–sharing for tropical forests. Nature Sustainability [Online] 2:53-61. Available at: https://doi.org/10.1038/s41893-018-0203-0. Boron, V. et al. (2019). Richness, diversity, and factors influencing occupancy of mammal communities across human-modified landscapes in Colombia. Biological Conservation [Online] 232:108-116. Available at: https://doi.org/10.1016/j.biocon.2019.01.030. As human-modified landscapes are increasing in the tropics, it becomes critical to understand how they affect mammal communities to reconcile conservation and development. We combined land cover information and camera-trapping data to explore the effects of agricultural expansion on mammals in the Magdalena river valley of Colombia. We estimated species diversity, evenness, and dominance across two agricultural landscapes, modified by cattle ranching and oil palm cultivation. We further assessed which variables influence species- and community-level occupancy using multi-species occupancy models. Results highlight that modified landscapes display lower species richness, diversity and evenness, and higher dominance than more pristine sites. Residual forest cover and distance to water had significant effect on community occupancy (positive and negative respectively). Forests were particularly important for pumas, ocelots, lowland pacas, Central American agoutis, and crab-eating raccoons while wetlands had a positive effect on jaguars, the apex predator in the region. The influence of anthropogenic pressure was not clearly evident, though pastures were not valuable habitats for any mammal species, as they had a negative, yet not significant, effect on species and community occupancy. In light of rapidly expanding agriculture across the tropics, our findings highlight species-specific responses to disturbance that can inform land use planning and conservation policies. We stress the conservation value of forest and wetland habitat to mammal occupancy in heterogeneous ecosystems. Moreover, our results demonstrate that oil palm and crop expansion should target existing pastures, which displayed limited conservation value for Neotropical mammals but occupy vast swathes of land across Latin America. Struebig, M. et al. (2018). Addressing human-tiger conflict using socio-ecological information on tolerance and risk. Nature Communications [Online] 9. Available at: https://www.nature.com/articles/s41467-018-05983-y. Tigers are critically endangered due to deforestation and persecution. Yet in places, Sumatran tigers (Panthera tigris sumatrae) continue to coexist with people, offering insights for managing wildlife elsewhere. Here, we couple spatial models of encounter risk with information on tolerance from 2,386 Sumatrans to reveal drivers of human-tiger conflict. Risk of encountering tigers was greater around populated villages that neighbored forest or rivers connecting tiger habitat; geographic profiles refined these predictions to three core areas. People’s tolerance for tigers was related to underlying attitudes, emotions, norms and spiritual beliefs. Combining this information into socio-ecological models yielded predictions of tolerance that were 32 times better than models based on social predictors alone. Pre-emptive intervention based on these socio-ecological predictions could have averted up to 51% of attacks on livestock and people, saving 15 tigers from the wild. Our work provides further evidence of the benefits of interdisciplinary research on conservation conflicts. Marchant, R. et al. (2018). Drivers and trajectories of land cover change in East Africa: Human and environmental interactions from 6000 years ago to present. Earth-Science Reviews [Online] 178:322-378. Available at: https://doi.org/10.1016/j.earscirev.2017.12.010. East African landscapes today are the result of the cumulative effects of climate and land-use change over millennial timescales. In this review, we compile archaeological and palaeoenvironmental data from East Africa to document land-cover change, and environmental, subsistence and land-use transitions, over the past 6000?years. Throughout East Africa there have been a series of relatively rapid and high-magnitude environmental shifts characterised by changing hydrological budgets during the mid- to late Holocene. For example, pronounced environmental shifts that manifested as a marked change in the rainfall amount or seasonality and subsequent hydrological budget throughout East Africa occurred around 4000, 800 and 300 radiocarbon years before present (yr BP). The past 6000?years have also seen numerous shifts in human interactions with East African ecologies. From the mid-Holocene, land use has both diversified and increased exponentially, this has been associated with the arrival of new subsistence systems, crops, migrants and technologies, all giving rise to a sequence of significant phases of land-cover change. The first large-scale human influences began to occur around 4000?yr BP, associated with the introduction of domesticated livestock and the expansion of pastoral communities. The first widespread and intensive forest clearances were associated with the arrival of iron-using early farming communities around 2500?yr BP, particularly in productive and easily-cleared mid-altitudinal areas. Extensive and pervasive land-cover change has been associated with population growth, immigration and movement of people. The expansion of trading routes between the interior and the coast, starting around 1300?years ago and intensifying in the eighteenth and nineteenth centuries CE, was one such process. These caravan routes possibly acted as conduits for spreading New World crops such as maize (Zea mays), tobacco (Nicotiana spp.) and tomatoes (Solanum lycopersicum), although the processes and timings of their introductions remains poorly documented. The introduction of southeast Asian domesticates, especially banana (Musa spp. ), rice (Oryza spp. ), taro (Colocasia esculenta), and chicken (Gallus gallus), via transoceanic biological transfers around and across the Indian Ocean, from at least around 1300?yr BP, and potentially significantly earlier, also had profound social and ecological consequences across parts of the region.